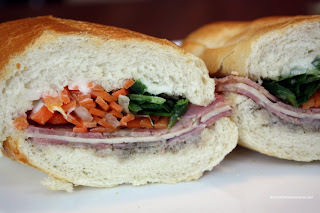 If you were strolling by on Main Street, it would be very easy to miss Kim Saigon Sandwiches. Hey, that's exactly what has happened to me. I wasn't even aware it existed even though I've probably walked past it a number of times. 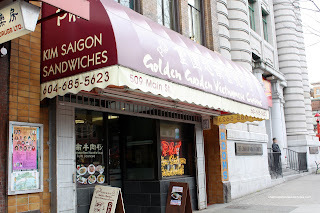 The reason for this apparent oversight is that Kim Saigon is located within another restaurant, which happens to be Golden Garden Vietnamese. Well, it is all one restaurant per se; but a Banh Mi stand greets you when entering the place. 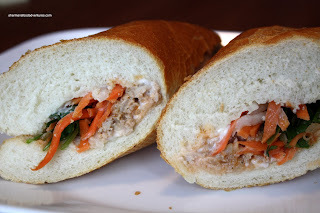 Returning from downtown, I was going to pick up some food for Viv and suggested that I get some Vietnamese subs. Knowing Viv, I had her at banh... Seeing how I've already tried Viet Sub and Ba Le (Chinatown), something different was in order. 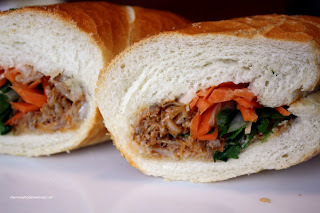 I quickly punched in "banh mi & Chinatown" into google and there it was - Kim Saigon Sandwiches. However, the address made me think since I didn't remember any banh mi joint at that location. Pulling into a parking spot in front, I realized that it resided in a former wonton noodle joint. In fact, Golden Garden is fairly new being roughly a year old. So I decided to get one each of the Cold Cut, Chicken and Meatball. Yah, it wasn't all for Viv! While waiting for my order, the sandwich making process was interrupted more than a Windows Vista user doing file management. What should have taken only 3 minutes took longer than 10. I don't blame them because it got really busy in the restaurant. However, not necessarily a good thing if someone was in a rush for take-out. When I finally got the sandwiches, I opened up the wrapping to let it breathe so that it didn't moisten up too much on the ride home. It turns out that the subs remained crisp and crusty, at least on the outside. If you look at the pictures, the bread itself is a bit dense and is not as airy like the ones at Ba Le (Kingsway location) or Tung Hing. However, that did not mean that the subs were bad. Conversely, I thought they were quite good. I particularly liked the cold cut as it reminded me of Ba Le's version (which I like). There was a good amount of fish sauce added so there was lots of flavour. The meatball and chicken subs were also quite good with a decent amount of meat. Not the best banh mi I've ever had; but pretty solid nonetheless.